Julian has been involved in the sporting arena since the early days of primary school. He made his way through school by competing in as many sports as possible. During his high school years at Greenside High School, Johannesburg, Julian competed in the A-Team Swimming from 1990-1994 – Captaining the A Swimming Team during his matric year in 1994. He played Rugby from 1990-1994 in the A-Team of each age group and played First XV for 1993 & 1994, during which years he received Half Colours for Swimming and Rugby. Julian then specialized in Martial Arts (traveling and successfully competing internationally as well as opening his own Kung Fu school), Cycling, (successfully participating in and completing 9 x Cape Argus Cycle Tours and 10 x 94.7 Cycle Tours), Triathlon (1 x Full Ironman in Port Elizabeth, South Africa & 2 x Half IronMan70.3 in Durban, South Africa, as well as the MiWay Ultra Triathlon Series), Obstacle Course Racing, and the obvious inclusion of CrossFit and multiple local and international CrossFit competitions. Other Industry Specific Seminars, Courses and Workshops include Olympic lifting, Kettlebells, and Martial Arts. Proudly including the SealFitComprehensive Academy, SealFit Kokoro Camp, and the Spartan Obstacle Specialist Qualifications. These all come together to create a holistic understanding of the body and a holistic way of training. Julian is a qualified and experienced personal trainer and sports conditioning coach with more than twenty years’ experience in the health, fitness, sports and martial arts industries in various training, management, leadership and motivational roles. He is a dedicated, enthusiastic and passionate individual who has single handedly shaped two young commercial enterprises. This entailed opening and administering a successful martial arts and health centre in Fourways, Johannesburg, as well as Fitness Technologies private personal training gym in Linden, Johannesburg. Julian also still finds time to contribute to his Monthly CrossFit Column in the Local Fitness Magazine. Fitness Technologies has successfully incorporated one of the pioneer CrossFit Gyms in South Africa, CrossFit Platinum, to become one of the front runners for the Sport of Fitness and CrossFit in Johannesburg and South Africa, the First and Original Reebok Recognized Affiliate in Johannesburg, and the Sole Importer & Distributor of Progenex Supplements in South Africa. Julian has practical and diverse experience as a teacher and trainer of clients, students and trainers at all levels with a particular focus on motivating clients, students and trainers for maximum success in their related goals. As a CrossFitter, Julian competed in the 2010 Regional Games in South Africa, placing Fourth overall in the Country. He placed 2nd at the Fittest in Cape Town Competition in 2011. Julian competed in the 2011 Reebok CrossFit Open and qualified for the Reebok CrossFit Regionals in Cape Town, South Africa where he placed 5th Overall in the Country. He competed in the 2012 Reebok CrossFit Open where he finished 10th overall in the country. Following which, Julian coached and competed with the Team from CrossFit Platinum that competed at the Africa Regionals of the Reebok CrossFit Games. Team CrossFit Platinum won the Africa Regionals and went on to represent the Africa Region at the 2012 Reebok CrossFit Games in Los Angeles in USA in July 2012. In 2013, Julian again qualified as an Individual but decided once again to join the Platinum Team. Team CrossFit Platinum won the 2013 Africa Regionals for the second consecutive year and, again, went on to represent the Africa Region at the 2013 Reebok CrossFit Games in Los Angeles in USA in July. 2014 saw Julian decide to send two competitive teams from Platinum to the Africa Regionals. The Platinum Team finished 2nd overall after a devastatingly close battle all weekend long. The second Platinum Team finished in 7th place with a spectacular showing of everything needed to be a podium Team. In 2015 Julian completed his first 70.3 Half Ironman in Durban. This was a precursor to the next challenge of travelling to Los Angeles, USA to complete the SealFit Comprehensive Academy and their ultimate Challenge of Kokoro Camp. Julian is continuing with the Triathlon and Ironman racing as well as his competitive CrossFit career by participating in local and national CrossFit events, now competing in the Masters divisions. He is also using his knowledge of CrossFit and Training to prepare himself and other clients for various Endurance events, i.e. 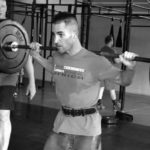 Over and above all the training, Julian is actively involved in trying to bring CrossFit, Functional Training, Health & Wellness, and Nutritional understanding into the Schools using the CrossFit and CrossFit Kids methodologies.